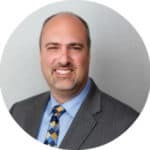 Procor’s Senior Vice President, Joseph Critell has compiled a list of when and where Hurricane Florence mandatory Evacuation Zones and Curfews occurred as a result of the storm. 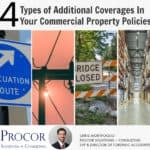 This data may prove useful to businesses filing a claim under Business Interruption and additional coverages such as Civil Authority, Ingress / Egress, and Contingent Business Interruption. North Carolina’s Governor Roy Cooper urged everyone in the coastal area to follow state evacuation orders. Currituck County has a mandatory evacuation for Currituck Outer Banks (Corolla and Carova) effective at 12 p.m. Tuesday, September 11. Onslow County has issued a mandatory evacuation effective at 11 a.m. on Tuesday, September 11. Dare County has a mandatory evacuation for visitors and residents in place now. It began on September 11 at 7 a.m. For all visitors and residents on Hatteras Island will be in effect beginning Monday, September 10 at 12:00 p.m.
Hyde County has issued a mandatory evacuation effective September 11 at 5 a.m. for the inland area and Ocracoke. Brunswick County has issued a mandatory evacuation for its residents in unincorporated areas who live “in low-lying and flood-prone areas or substandard or mobile homes” beginning at 7 a.m. on Tuesday, September 11. New Hanover County mandatory evacuation for UNCW effective at 8 a.m. on September 11. Tyrrell County has a mandatory evacuation starting on Wednesday Sept. 12 from 8 a.m. to 8 p.m.
Pamlico County has issued a mandatory evacuation effective on September 11 at 3 p.m.
Craven County has issued a mandatory evacuation effective on September 11 at 2 p.m.
Fayetteville and Wade Counties issue mandatory evacuation order for Little River & Cape Fear River residents effective on September 16, 2018 at 3 p.m. Governor Henry McMaster has ordered an evacuation of the entire South Carolina coast. These evacuations are mandatory and include Horry, Georgetown, Charleston, Berkeley, Beaufort, Jasper, Colleton, and Dorchester counties beginning at 12 p.m. on Tuesday, September 11. However, after the press conference on September 11, he rescinded the order for Beaufort, Jasper and Colleton counties. 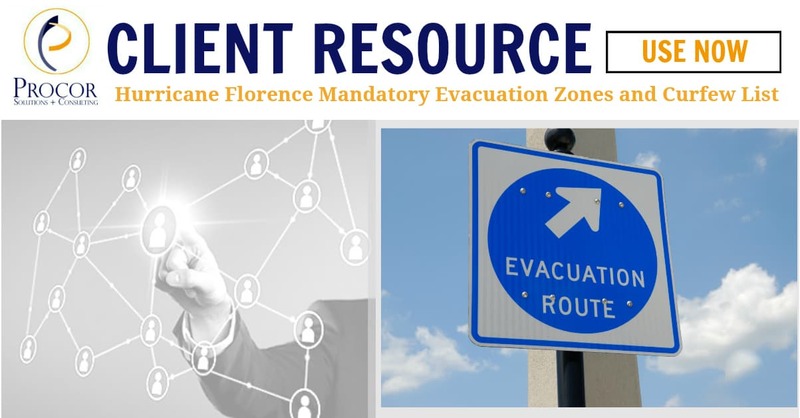 Governor Henry McMaster Saturday (September 15) announced that evacuation orders for Horry and Georgetown counties will be lifted Sunday morning, Sunday, September 16 at 9 a.m. On September 15th, the governor lifted evacuation orders for all other previously evacuated zones. Governor Ralph Northam issued a mandatory evacuation order for coastal Virginia residents in Zone A in advance of Hurricane Florence, effective Tuesday, September 11 at 8 a.m. Zone A includes low-lying areas of Hampton Roads and the Eastern Shore. Residents of Zone A are urged to move to higher ground. On September 14, Governor Ralph Northam lifted the mandatory evacuation of residents in Zone A of Hampton Roads, the Eastern Shore, Northern Neck and Middle Peninsula at 11 a.m. on Friday, September 14. following the National Weather Service lifting the tropical storm warning for coastal Virginia. Duplin County - 7 p.m. to 7 a.m.
Brunswick County - 16 at dusk through dawn on Monday, Sept. 17. The county remains under a mandatory evacuation order for all unincorporated areas of the county. Martin County - 13; 8 p.m. to 6 a.m.
New Hanover County - 14; 10 p.m. to 6 a.m.
Robeson County - 14; 8 p.m. to 7 a.m.
Tyrrell County - 12; 8 p.m. to 7 a.m.
Wayne County - 14; 9 p.m. to 6 a.m.
City of Wilmington - Sunday, Sept. 16, curfew now runs from sun down to sun up. Florence County - 8 p.m. until 7 a.m.
Evans County - Curfew until further notice. Tattnall County - Midnight until further notice. Wayne County - 8 p.m. to 8 a.m.
City of Conway - A curfew is in place from 7 p.m. to 7 a.m. and will remain in place until further notice. Dillon County - City of Dillon and Town of Latta lifting curfew for Monday; Dillon County will remain on curfew 8 p.m.-7 a.m.
Latta - a curfew for Sunday is in place for the day until further notice. Lumberton, N.C. - Starting Thursday, the curfew hours will be from sunset to sunrise and will remain active until further notice. Marion County - Starting Monday, a curfew from 8 p.m. to 7 a.m. will be in effect until further notice. This curfew covers the City of Mullins, Town of Nichols and Town of Sellers. The City of Marion - Starting Monday will be implementing a curfew within the city limits from 8 p.m. tonight until 7 a.m. tomorrow. Myrtle Beach – starting September 14 at 7 p.m. to September 15, at 7 a.m. The city first issued a curfew September 12 from 10 p.m. to 6 a.m. and September 13, from 7 p.m. to 7 a.m.
Beaufort - 7 p.m. to 7 a.m. for residents on the islands.